This cream comes in a jar-like bottle like many other facial creams such as Noxzema, however it is specifically meant for the treatment of eczema symptoms. Not only do they claim that it cures eczema, but it also moisturizes and one application will provide round-the-clock protection for 24 hours rather than having to consistently re-apply like with many other products. The natural formula contains ceramides, material that is present in human skin that aids to the restoration of damaged skin. The formula is mostly made up of cetearyl alcohol and caprylic triglycerides, but it is a water and glycerin base like most moisturizing creams. While the cream does admittedly moisturize very well, and most customers will agree with that, it does little for people with eczema. This is a product meant primarily as a lotion, and does not do as much for people that have a legitimate skin problem. While this will moisturize skin and relieve some symptoms of eczema, it will only last as long as the coat of lotion stays on your skin. Especially for people that are very active and are at risk for this lotion rubbing off during the course of the day, it might be a better idea to look elsewhere towards a product that will be more invasive and treat the problem at its source. CeraVe does not attack eczema at its source and only provides superficial care. I have been using CeraVe for two days now. My dermatologist recommended using this product along with Dove soap. In addition to not taking hot showers or bath. I have ezcema. My skin was really itchy and rough. Over the course of 2 days the roughness and peeling has ceased. My ezcema may hav met its match. This product is not greasy or heavy. It is pleasant smelling has a decent price. I love this product, I have been fighting dry, cracked and flaky skin all my life, ( I’m not a youngster). After I shower I apply CeraVe cream then I was a lotion over the top,because it feels a little sticky,I’m good for the rest of the day. Usually I have to re-apply all day long; not with this product I love it. I did notice a difference in my skin after the first time I used it.Since I started using CeraVe I’m not itching to death as soon as I get out of the shower,my skin still feels good. the reviews I read used the word “relief and not cure. I am looking for a product to correct and cure. My dermatologist recommended CerVe cream for my chronic uticaria (hives and extreme itching). She said to use it twice a day, once right after showering to seal in the moisture. I have been using it for about a week and it seems like it makes me itch MORE. My skin feels softer and kind of rubbery, but it’s chalky too. I’ve tried a light, thin layer as the pharmacist recommended, I have also tried a thicker layer, as my Dermatologist recommended. Either way, I itch! Any suggestions? I HAVE HAD EZCEMA SINCE I WAS TEN YEARS OLD, AS I GOT OLDER IT GOT WORSE. I COULD NEVER WEAR SHORT SLEEVES OR PANTS. LAST YEAR DR. DAVID HORWITZ TOLD ME ABOUT CERVE. I HAVE BEEN USEING IT SINCE AND I LOOK LIKE A DIFFERENT PERSON. THE PEOPLE THATS LOOKING FOR A CURE I DON’T THINK THERE IS ONE. I STILL HAVE FLARE UPS BUT THE CERVE CREAM AND THE OINTMENT HE PRESCRIBED USUALLY DOES THE TRICK. There is no cure for this issue..That was sound info that I was given over thirty yrs ago at the Skin & Cancer Hospital in NY..I was also told that this is a form of Herpes believe it or not. It may go away for yrs..and then return randomly with various degrees of severity. The outer effects are not the cause, just a very highly annoying effect of what is going on internally. Naturally, it is best to limit exposure to those things that will indeed effect the outer part of the body (skin) as it will exacerbate the effects most dramatically. Water is the most obvious, and exposure should be decreased as much as possible.. Meaning those long hot baths are pretty much a lost art for us who suffer..Water Temps must also be cooler..Chemicals such as those used in Swimming pools,cleaning agents, shampoos etc… can also extend the suffering..Bottom line is that from time to time internal, & external steroids may be a necessary evil..along with diet change..and other internal measures such a Primrose Oil may be effective for some. What works for me may not always work for another, and it seems to be a lifetime effort to find the RX that will work for you. That may also change from time to time as this condition can become immune to our tactics & we find that we have to change up depending on how we are responding to our current measures. Sadly this condition is not curable, & all we can do is share those things that we have learned over time with other sufferers, & pray that the flare ups are far & few! It’s a battle no doubt..and has rendered me unable to use my hands for as much a month! Cloaked in White Cotton Gloves during sleep..and never at the sink without protection from water! I have even used cotton gloves under the rubber gloves to protect me from the Rubber or Latex which for me is like putting my hands into a vat of Acid! YIKES! I have lost my ability to work at 2 professions that I loved due to this condition..I know how bad it can get..SO it is that I wish you all the best fellow sufferers..Let us continue to share our experiences and be hopeful that we can all keep each other well & able.. I have an 8 year old daughter with severe atopic dermatitis and a primary immune deficiancy. There is no cure for eczema. But you can treat it with medications and moisturize OFTEN!!!! I use ceraVe 3 times a day and Aquaphor in the morning and before bed on top of ceraVe to seal in moisture. We have tried every product out there and this helps her the most. God willing one day she will out grow her eczema. It is a terrible thing to watch your child suffer the way she has. Good luck to all who suffers from this!!!!! I was just on the website for CreaVe reviewing the product information since my dermatologist just recommended this to me. I saw no where on under moisturizing cream or lotion product information about it being able to cure or help eczema. It didn’t see that claim, that may have come from your dermatologist. 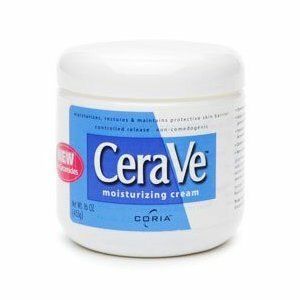 I have both eczema and very dry skin my dermatologist told me to use the CreaVe for the dry skin and gave me prescription for the eczema. I think the opening review maybe a little misleading in that nature. I have used this product for a couple of day now and so far have had great results for dry skin, which is what is intended for. I use CeraVe for my Grovers Disease. It trully helps. In response to v.menchaca I also had awfull itching for over a year, I finally found a dr. that tested my skin and found the Grovers Disease. All the dermas I went to said it was stress related hives. Just a clue that you might think about. I had just this year started having patches of dry itchy patches on my face! The were irritated and red. I picked up the CeraVe cream and what can i say…WOW. Not greasy or oily and my face looks great. I use it at least two times daily and am very greatful to have found it! My husband gets super cracked, dry, leather like hands in the winter. Someone gave him a small jar of the cream and it healed his hands overnight. So I have been using it in the morning and night and it is wonderful. I have no more dry patches I get from my job, hairstylist… And my hangnails are gone in like two days. It’s not greasy either. It’s a great product. How can you get coupons for the Cerave Cream ? My Dad goes through at least two jars a mouth . My husband was recently diagnoised with eczema. The dermotologist gave him an injection. Three weeks later he got another injection. Now all the symptoms are gone. Initially the doctor thought 3 injections would be required. The problem was corrected with two. No he will begin using the Cerave Renewing Lotion (on advice from the doctor) as soon as we can find it. Thank you for all the very important reviews. my uncle recently moved in with us he is 85 and has lived alone with no assistance until a few months ago,he had this awful itching, he went to see a dermatologist in Washington were he lived, multiple creams were prescribed with no relief, then the rash started. any way to make a long story short he ended up having to relocate, we took him to another dermatologist, and the PA recommended CeraVe, and all I can say is thank you, the Grovers Disease,symptoms are gone, he has no rash and the most important benefit is the chronic itching is completely resolved after 6 mo. and 2 hospital visits. My dermatologist recommended this for very dry skin which is primarily on the palms of my hands. She did not mention it as an issue to cure any disease, just as a moisturizer. She even gave me a sample. Seems to be better than any of the other moisturizing lotions that I have.